Pregnant women have a higher risk of developing hernias because of the extra pressure that a baby puts on their abdominal muscles. Although a woman’s body is designed to withstand the stress of bringing a child into the world, pregnancy still causes a lot of strain, especially in the abdominal region. The muscles that lie over this area naturally separate some to make room for the growing child, but if a woman is obese or she gains weight too quickly, they can tear. When this happens, the condition is called a “hernia.” Since the muscles hold in the bowels and internal organs, a hernia allows them to fall through it, which increases the risk of them becoming constricted. 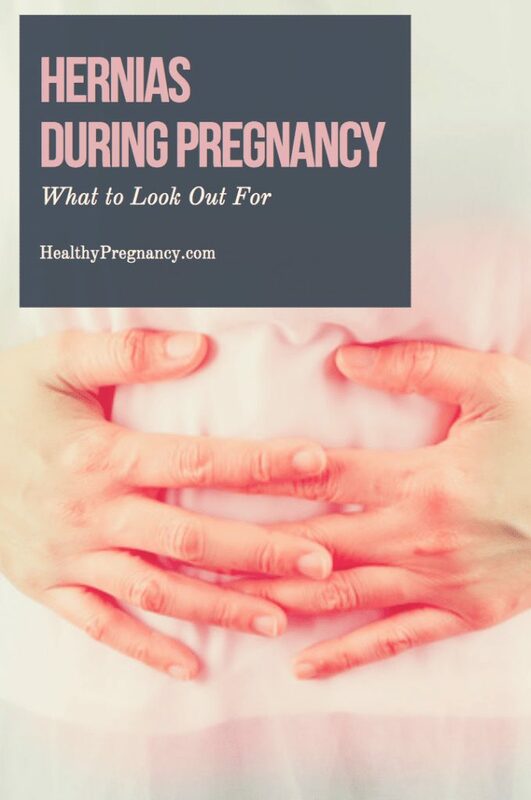 Because of this, it is important that all women who are pregnant or planning on being pregnant in the future know what the signs of a hernia are and what to do if they get one. Read on for more information about this condition. This type of hernia happens at the site of a woman’s belly button. So it is also sometimes called a “belly button hernia.” An umbilical hernia usually occurs when too much strain is put on the abdominal wall. This causes tissue to protrude through a weak spot or gap in the abdominal muscles. There is an increased risk during pregnancy because of the significant added pressure on the abdomen. Other risk factors include ascites (fluid accumulation in the abdomen), overweight, diabetes and chronic lung diseases such as COPD. An umbilical hernia generally causes little or no discomfort, but occasional pain may be felt when coughing, pressing or lifting. After the baby is born and the pressure subsides, the belly button usually returns to its normal size. Postnatal exercises can help with this. Only in rare cases does an emergency arise if the intestines partially push through the gap in the abdominal muscles and become trapped in the hernia sac. If the muscles just above the groin are too weak to support the extra pressure, a hole can tear into them. This is problematic because the reproductive organs can become constricted. The most noticeable symptom is a bulge protruding up. Since a pregnancy places particularly high pressure on the abdominal wall in the groin area, an inguinal hernia is more likely to occur during this time. In an inguinal hernia, the lining of the abdominal cavity develops a baglike protuberance as the intestines push through a gap in the abdominal wall by the inguinal canal. Possible symptoms include a feeling of pressure or mild pulling pain in the groin area. An inguinal hernia generally requires surgery since it does not recede on its own. During pregnancy, a doctor decides whether the procedure should take place right away or after the birth. A so-called hernia truss can be used as a temporary measure. In rare cases, an inguinal hernia can lead to a life-threatening intestinal obstruction that causes severe pain, vomiting and fever. In this case, immediate surgery is required. Women who have previously had any surgery that cut through their abdominal wall have the highest risk of getting an incisional hernia. If the muscles weren’t stitched back together properly, they can come apart from the extra pressure. A gap develops in the abdominal muscles, through which the intestines bulge outward into a protrusion in the abdominal wall. An incisional hernia usually occurs within the first year after surgery. The protrusion is particularly noticeable after intense exertion and can gradually increase in size. In addition, a pulling pain in the scar area as well as digestive difficulties may be experienced. As with inguinal and umbilical hernias, the intestines can become trapped in rare cases, necessitating emergency surgeryThis type of hernia can quickly grow in size if it isn’t treated right away. A diaphragmatic hernia occurs when the stomach or parts of the stomach pass through the diaphragm and move into the chest cavity. During pregnancy, there is a higher risk of a diaphragmatic hernia because of the weight gain involved and because the increased amount of adipose tissue exerts a greater pressure on the organs when lying down, causing the organs to shift upward. The growth of the baby in utero can also lead to organ displacement. However, diaphragmatic hernias usually recede after delivery. 90 percent of those affected experience no symptoms, causing the hernia to remain undetected. In some cases, however, symptoms such as heartburn, upper abdominal pain, difficulty swallowing and abdominal cramps may be experienced. A diaphragmatic hernia usually doesn’t require treatment, and surgery is only recommended in case of severe pain and serious damage to the esophagus. An abdominal wall hernia can also occur more frequently during pregnancy since the growing fetus puts strain on the mother’s abdominal cavity. The volume increases, which increases the pressure inside the abdomen. When the connective tissue that supports the abdomen is no longer able to withstand the high pressure from the inside, a gap through which the internal organs and lining of the abdominal cavity protrude can develop in the muscles. Diastasis recti (the separation of the abdominal muscles around ​​the linea alba) is a normal part of pregnancy and primarily affects women who have had several pregnancies. Most cases are symptom-free, but a visible and palpable bulge can develop. As the pregnancy progresses, pain may occur in the hip, buttocks and lower back. Delivery can also become more difficult. After the birth, however, the gap in the abdomen closes by itself within a few months. An abdominal separation rarely requires surgery. Weight loss and exercises that target the abdominal muscles can usually provide relief. A femoral hernia is one of the external abdominal hernias. With this type of hernia, the hernia site is located below the inguinal ligament in the groin. It develops when there is an increase in pressure in the abdominal cavity, causing a portion of the intestines to bulge through the gap. This can especially occur during pregnancy, but overweight, advanced age and weakness of the connective tissue are also possible risk factors for a femoral hernia. Often there are no symptoms at all, but in some cases, a femoral hernia may cause diffuse pain in the groin or irregular bowel movements. Since this type of hernia doesn’t recede on its own, it must always be treated surgically. Most doctors have a “wait and see” approach when it comes to treating any type of hernia. If it is posing no immediate health problems to the mother or child, then they try to wait until after the baby is born to treat it. But if it worsens or the pain becomes unbearable then they often have no choice but to perform surgery to stitch the abdominal muscles back together again. This type of surgery is preferably done after the second trimester when the baby is more developed. So remember, if you notice any unusual lumps or bulges in your abdomen don’t wait. Get to the doctor immediately. If the pain is severe, then head straight to the emergency room for treatment. Never try to push the bowels or organs back into place yourself. And don’t wear anything that could constrict the abdomen because this could make the problem worse.